15 minutes to Rapid City, Keystone, Hill City, Mount Rushmore & Custer State Park. Full RV hook-ups, cabins & spots for tents. Plenty of pine trees and lots of family fun! Private, secure & quiet. Perfect for your base camp! 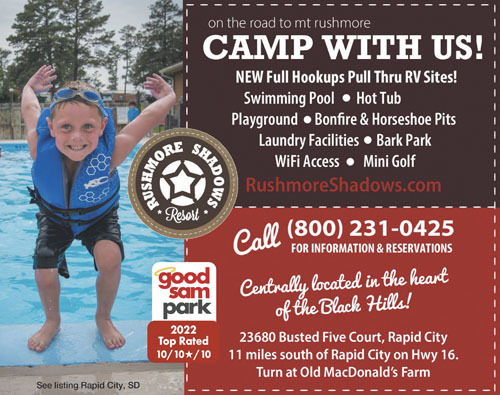 We went to Rushmore Shadows because we needed a place convenient to Rapid City. We got a very good package deal to stay that required us to sit through a 90 minute presentation to buy into Midwest Outdoor Resorts. We were not pressured to buy (which was a relief). The resort has a pool that is way to small for the size of the resort and miniature golf. Our site was not concrete because we were placed in the older section with trees. There is a brand new section at the entrance that is all concrete but has no trees. The office staff and camp workers were very nice. If you can stand a 90 minute presentation, it's worth it because the nightly rate is around $70. 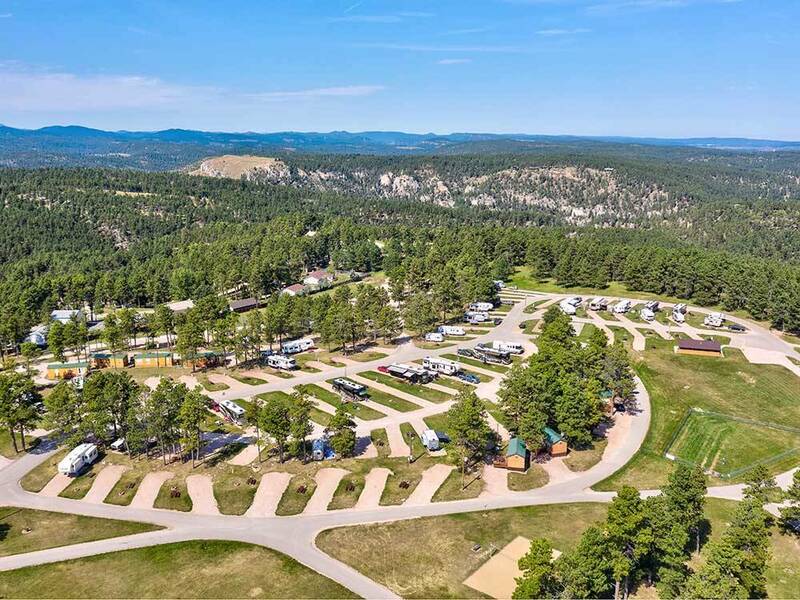 Very nice RV park with a great location. The sites are concrete and plenty long enough for a full size RV and tow vehicle. The park offers OK wi-fi with the standard bathroom/laundry facilities. We will definitely stay at this park again. See our pictures and full review at www.thegilliamsisland.com. Great putt putt golf for the family. Beautiful grounds to walk. very clean. Nice pool and plenty to do activities around the area. Not far from Mt. Rushmore and that is why we were there. Nice park and close to attractions that we wanted to visit in the area. Our site was in a newer part of the park for larger RVs. No trees, etc. but large sites and easy to navigate. Nice amenities such as the pool and miniature golf. Wifi only worked when we were at the office. My Verizon Mifi did work well. I would recommend this park and would stay here again. I don't know why this park as such a high rating. The location is good but that is it. They put us in the new section which is right as your come into the park. The sites were recently done but no grass and it poured rain the day before and the concrete pads were full of mud. We checked out the interior of the park where the majority of the campers stayed and it was extremely crowded and not much space between the sites. The Good Sam book shows they give a AAA discount but they said they do not give the discount. I would not go back to this park again as there are others in the area that appear to be better.